Vibrant Vans Era trainers from the collaboration with British fashion designer, Ashley Williams. The low top trainers have canvas uppers with a bright pink tiger stripe pattern and a white jug print on the heel and toe. The lace fastened trainers sit on a white vulcanised rubber sole with Vans X Ashley Williams branding in a signature Vans checkerboard pattern. 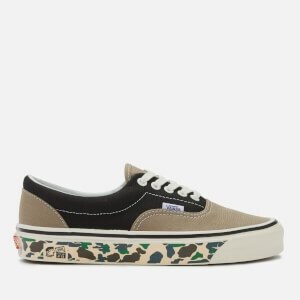 The sneakers retain signature Vans details, including a Vans flag on the outer side, an ‘Off the Wall’ licence plate on the heel and a rubber waffle outsole for added grip. The size on the size guide is inconsistent with that on the shoe box.